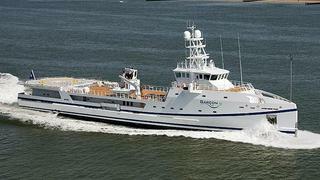 The latest Sea Axe support vessel to be launched by Dutch yard Damen Shipyards, Garçon 4 Ace, has now been delivered. She is destined to be the support vessel to the Lürssen superyacht Ace. With a length of 67.15m, Garçon 4 Ace is also the largest vessel in the Sea Axe range: she has 360m² of exterior deck space and 140m² of interior deck space accommodating 21 crew and staff. Powered by four 1,425kw Caterpillar engines, she can reach a top speed of 25 knots, with a range of 4,500 nautical miles at 18 knots, and her special Axe Bow allows her maintain high speeds in all sea conditions. Special features include a helipad fully certified for large helicopters (take-off weight of 5,000kg). Garçon 4 Ace, and her mothership Ace, will both be displayed at the Monaco Yacht Show in September by their respective yards. Both were sold and their build projects managed by Moran Yacht & Ship.